All types of coconut oil undergo some refinement to be obtained, to a greater or lesser degree. Among all types of coconut oil, the one considered as ”virgin” is the one that undergoes less refining process. It is extracted from fresh coconut meat, not copra (dry coconut pulp). Refined coconut oil is obtained from the mechanical and chemical refining of crude oil in order to become thinner, colorless and odorless. It is important to emphasize that the refinement processes for the production of refined oil only promote the loss of some nutrients from the oil, but maintain their fatty acids and their quality in general. Its process of ” bleaching”, for example, is not done with the use of chemical agents; a filtration is carried out to remove the impurities. So it is wrong to say that only virgin coconut oils are ”healthy ”. 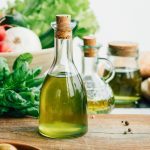 Oil is the most suitable cooking oil because, as a medium chain triglyceride, it can reach high temperatures without oxidizing and without changing its nutritional properties. Oil is a medium chain triglyceride; it is easily absorbed and transformed into energy in the liver, not accumulating as a fat in the adipocytes. It also speeds up the metabolism, thus favoring fat burning. Oil brings excellent results to the hair and skin, not only by oral use but also when used topically. It can be used on the hair before bed, which results in hair with more shine and lower fall. The potent oil inhibits the action of the 5-alpha-reductase enzyme, which prevents hair loss in the case of idiopathic alopecia. Oil can be used in various ways such as in the fried rice, for frying, for grilling meats or even in the making of cakes and pies. To do this, simply replace the fat you usually use, sunflower oil, butter or olive oil for example, by coconut oil in the same quantities. So if you usually use 2 tablespoons of olive oil just replace them with 2 tablespoons of coconut oil to enjoy its benefits, which are higher when it is extra virgin. However, it is not recommended to consume more than 1 tablespoon per day, considering all that a person can eat in a day. Preparing homemade masks with coconut oil is very simple, being only necessary to choose some ingredients for the mask and add a few spoons of this amazing oil so that your hair is more nourished, hydrated and strong. However, although very nutritious, this oil should not be applied neatly on the hair and you should always choose to use extra virgin, cold pressed and 100% natural coconut oil.